We offer you the opportunity to attend one of the most beautiful historical re-enactments on the Italian Riviera: the Festival of San Benedetto in Taggia. The commemoration of the battle won against the troops of Savoy, the historical procession and the typical medieval market will allow you to immerse yourself in an ambiance from an earlier time! Afternoon arrival at the hotel, dinner and overnight stay. In the morning transfer to Taggia to stroll through the quaint medieval market stalls, where you can buy products typical of the valleys of the Riviera of Flowers. In the afternoon you will have the opportunity to attend the historical re-enactment of the great battle won against the “savoiardi” that was decisive for the liberation of Taggia. In the late morning the historical settings begin, authentic living depictions of everyday life in the valley in the seventeenth century, which precede performances by invited groups of entertainers, who will compete in rounds of demonstrations of skills and dances from the past. Lunch at a typical restaurant to taste the specialties of the cuisine of Taggia. 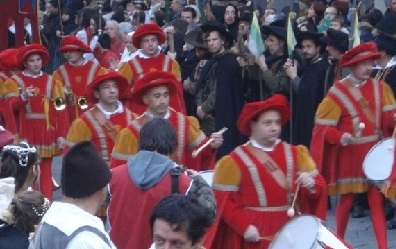 In the afternoon there will be a classic historical procession in honor of St. Benedetto Revelli, patron saint of the town, where over 500 local participants in costume will parade before the public. At the end, return to the place of origin. The round trip, all local transfers and all that is not included under “our offer includes”. Lunches and dinners are to be chosen according to the daily menu or the tasting menu offered by the chef. Drinks and a la carte snacks are to be paid for on the spot.